Before I bore you with details let me just tell you that the secret magical answer is to take the bus! Voila! See, that wasn’t so hard now was it? I always check Eurolines first and go from there. Now that you already know the answer, let’s talk more about it and I’ll explain why I find myself using the bus more often these days and how you can find a bus ticket, especially if Eurolines does not go there or is not the cheapest option (there are many regional bus carriers throughout Europe). Why Take the Bus instead of a Train? I started using the bus because I found out that it goes everywhere the damn train does but just a lot, and I mean A LOT, cheaper if you are traveling last minute. If you plan your trip weeks or months in advance, or sometimes even just days in advance, the bus is maybe not the best option since you may find a cheaper plane or train ticket; but, if you buy a ticket a few days or less in advance, it will save you soooo much money. The other day I was looking to go from Vienna to Amsterdam last-minute and the direct flights were over 400 euro, indirect flights over 200 euro and over 10 hours, and the train was over 200 euro and over 10 hours travel time. However, the bus was only 80 euro – granted it is a 20 hour bus ride. So, you have to ask yourself how much your time is worth because, if you take the bus, you are basically paying yourself the difference between the bus ticket and whichever other ticket you would have purchased. I want to point out that if I had purchased the train ticket between Amsterdam and Vienna a few days in advance, or a week or more in advance, it would have only cost about 65 euro. So, taking the bus is perfect really for last minute traveling through mainland Europe because they usually do not change the prices for the tickets. This means a bus ticket purchased a month in advance will be, in most cases, almost the same price as one purchased the day of travel. What Bus Company Should You Use? 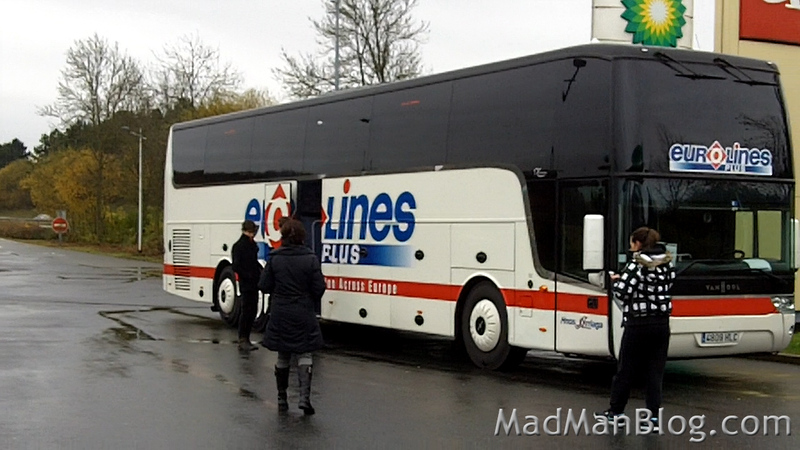 The biggest and most popular bus service in all of Europe is Eurolines. They basically go everywhere you can imagine and more. The website, as posted above, is http://www.eurolines.com. With this company, you will almost always be able to purchase your tickets online through their website and then you just print the tickets and show up to the designated bus station. And, did I mention, they basically go EVERYWHERE. Eurolines is the big boy on the block but they are usually not the cheapest, especially if you are traveling regionally, such as within one or two countries, remember the countries in Europe are the size of a postage stamp. As such, I usually first check the Eurolines website to get a benchmark for the price and then go searching for other bus lines. I usually just search “paris to brussels by bus” or something similar and browse through the results for something that looks good and is cheaper than Eurolines. That’s how I found iDBus – http://uk.idbus.com/ and it was cheaper to use this to go to Brussels from Paris. I recommend first checking the Eurolines website and then looking for competing bus companies through an online search. After writing this article I realized that I should address the issue of safety. When I first got to Europe I would have never taken a bus because the train system here is just so amazing, efficient, and simple. Also, buses kind of scared me. However, when I got to the Eastern European region, I was forced to ride buses and realized that they are not so bad. In fact, I have never had a single thing stolen from me on a bus and I have never had anything happen to my bag below the bus. I’m sure there are shady bus lines and shady places where something would happen, but if you go with reputable carriers, you shouldn’t have a problem. Also, never store your valuables in the bag that you put under the bus. This way, if something does happen to that bag, you are not totally screwed. And when the bus takes a bathroom/rest break and people get off the bus, just bring your valuables off the bus with you. This doesn’t mean something won’t happen to you, it just hasn’t happened to me the 30 or so times I’ve taken a long distance bus in Europe, everywhere from Spain to Serbia. I feel totally safe now taking a bus in Europe and you should too! Everything depends on the route so there is no single answer. I have paid from 10 euro to go a couple hours to 90 euros to go 20 hours, all tickets purchased at the day of or before departure. Booking in advance will get you cheaper tickets depending on the route.